In order to provide a comprehensive training program, training must include university / college coursework offered for credit. There are a number of institutes of higher education throughout the state offering courses and programs designed to advance personnel development and knowledge regarding autism spectrum disorder. VCU-ACE provides a comprehensive list of coursework in autism spectrum disorder and effective intervention practices including applied behavior analysis. In addition to the Consortium, several other Virginia universities offer coursework in Applied Behavior Analysis. Please visit our additional ABA coursework page for more information. Comprehensive certificate programs in ASD are now offered at a number of colleges and universities throughout Virginia. Certificate programs are available at both the undergraduate and graduate level providing valuable options for both professionals and paraprofessionals. 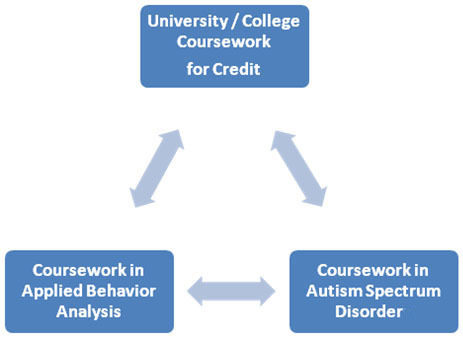 Please visit our ASD coursework page for a list of programs that offer this coursework and more information. The Virginia Consortium for Teacher Preparation in Severe Disabilities is comprised of five state approved teacher preparation programs in severe disabilities (SD), including George Mason University, Norfolk State University, Radford University, University of Virginia, and Virginia Commonwealth University. The consortium's primary goal is to prepare teachers across the state to be highly skilled at working with learners with SD. The program is designed to increase the number of fully endorsed teachers by providing training to new full-time pre-service personnel and to accelerate the training for those already teaching on conditional licenses. A common licensing curriculum, which includes 33 graduate credit hours of coursework and field experiences, has been developed across participating universities. Each class uses video conferencing technology to establish real-time, interactive, multipoint conference instruction among the five university sites. Individuals interested in applying to the Severe Disabilities (SD) Consortium must meet the admission requirements of their selected university. Furthermore, individuals need to complete the SD Consortium application and submit it to the SD faculty member at their university. The SD Consortium is supported by grants from the Virginia Department of Education and the U.S. Department of Education. Every semester, the Consortium awards a limited number of tuition stipends to qualified applicants. Please note that application procedures vary for each university. However, all applicants must have passed Praxis I or the SAT/ACT equivalent for admission into the SD Consortium. For more information, visit the Consortium website.